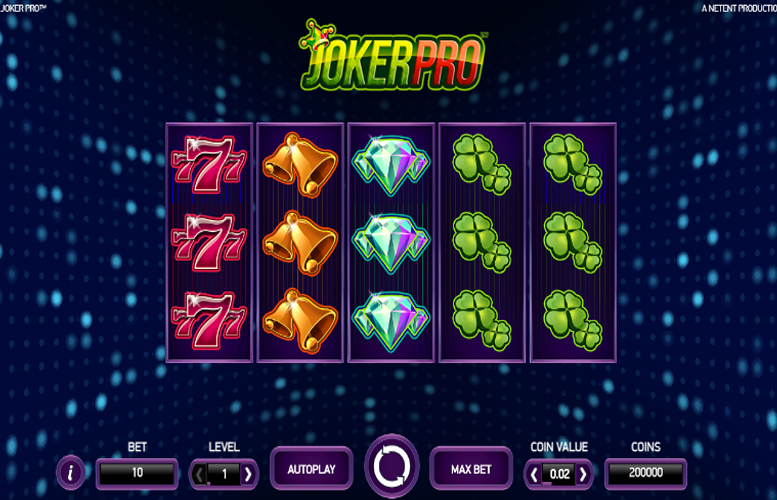 The Joker Pro slot from Netent uses classic casino imagery that’s almost been brought into the 21st Century. It offers players an innovative bonus feature, a high return-to-player rating, and unfortunately, that’s about it. There is a lot wrong with this slot machine and little right. Let’s have a closer look at the specifics. Interesting bonus feature. We’ve not seen another slot machine make use of a gameplay mode quite the Joker Pro Re-Spin before. We love to see game designers striving for innovation. High return-to-player rating. This would make it an ideal game to wager through a bonus on. Low main game prizes. 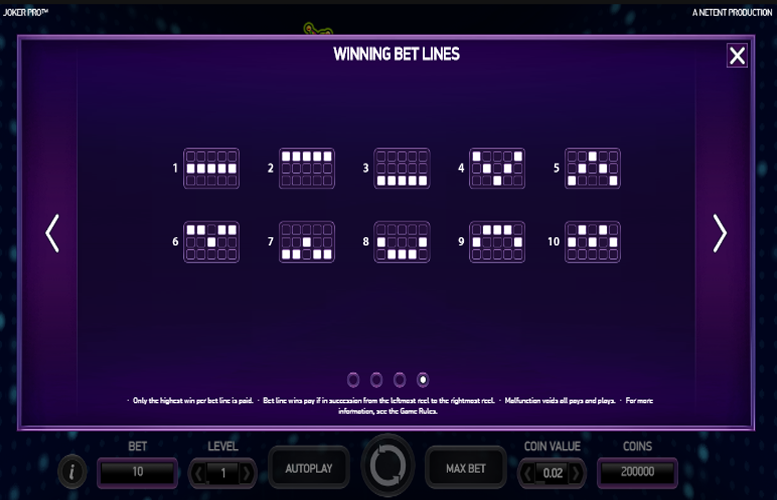 Some machines allow players to win 10,000x the line bet. This makes Joker Pro’s 200x the line bet seem miniscule. Just one bonus feature. It might be creative but the lack of a true free spin mode or second screen side game limits the enjoyment of Joker Pro. Diamonds = 200x the line bet. Lucky Sevens = 100x the line bet. Liberty Bell = 60x the line bet. Horse Shoe = 50x the line bet. Clover = 40x the line bet. 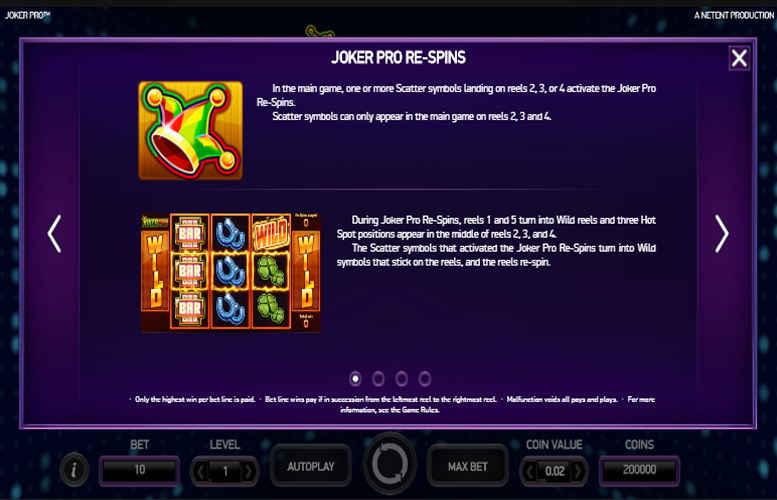 During the main game, one or more “scatter” symbols landing on reels two, three, or four will activate the Joker Pro Re-Spins. The “scatter” symbols can only appear in the main game on these reels. During the feature, reels one and five turn into “wild” reels and three Hot Spot Positions appear in the middle of reels two, three, and four. The “scatter” symbols that activated the Joker Pro Re-Spins turn into “wild” symbols that stick to the reels, and the reels re-spin. 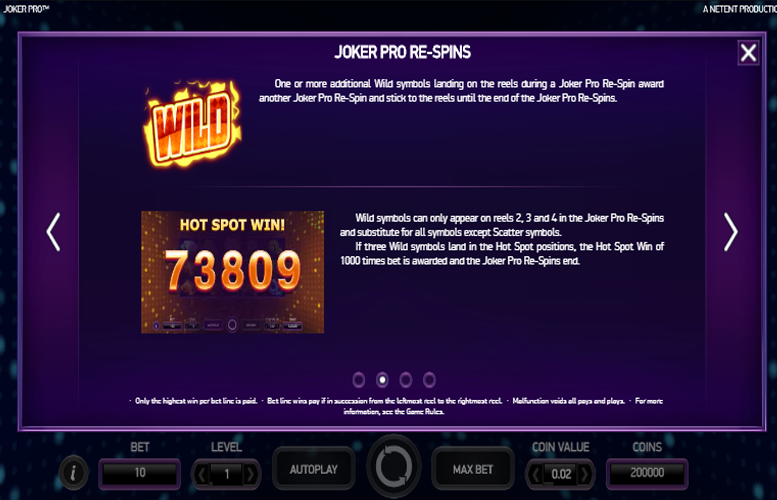 One or more additional “wild” symbols landing on the reels during a Joker Pro Re-Spin will award another Joker Pro Re-Spin and will also stick to the reels until the end of the Joker Pro Re-Spins. During the bonus, “wild” symbols can only appear on reels two, three, and four. They will substitute for all symbols except the “scatter” symbols. If three “wild” symbols land in the Hot Spot positions, the Hot Spot Win of 1,000x the bet is awarded and the Joker Pro Re-Spins end. The number of win lines are fixed on the Joker Pro slot machine. For that reason, 10 lines must be played on every spin. Players can only adjust the number of coins bet per win line and the value of each of them. The highest and lowest coin values are £1 and 1p respectively. 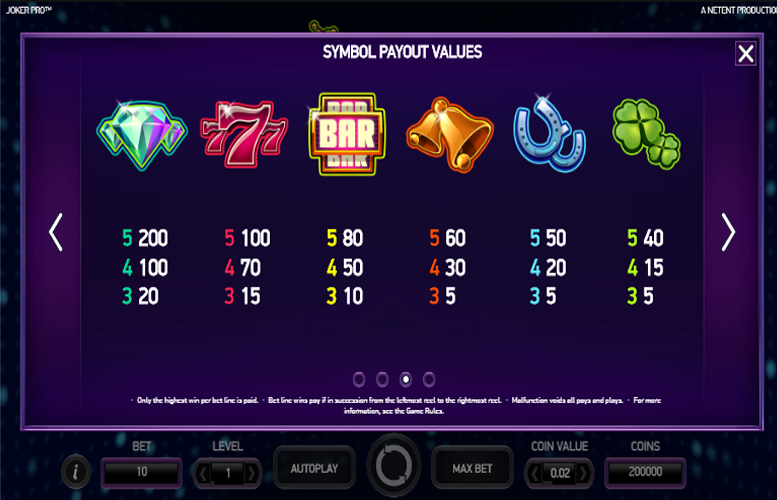 Meanwhile, the player can choose to bet between one and ten coins on every line. This means that with all the values set to their minimum, the lowest possible bet per spin is just 10p. Conversely, with everything maxed out, the highest possible wager per turn is £100. This upper betting limit should easily satisfy all but the highest rollers around. All told Joker Pro is certainly one for fans of basic games. It has a simple art style and just one bonus feature. The Joker Pro Re-Spin mode is an innovative addition but whether it offers enough excitement to keep players returning on multiple visits is debateable. Those who enjoy classic casino games might get a kick out of Joker Pro, but all others are best advised to steer clear of this one. It’s just not that exciting! All that said, the game does offer players a high return-to-player rating. This might make it suitable for grinding through a bonus, if you can find a casino that allows players to wager bonus funds on such a fair slot machine that is.